Are you looking for math games designed to spark kids’ interests? If they’re sports fans, then you’ve come to the right place! We’ve rounded up the most extreme math games for kids who love sports. Whether they’re fans of football, baseball, basketball, or prefer to stick with the rousing sport of mini golf, there’s likely a game for them on our list. So batter up and prepare to take the field with these sports-themed free math games! One-Step Equations Basketball Game has kids solve one-step equations for the chance to catch the ball and shoot a free throw. This game is ideal for kids in middle school. Kids can also play the game with a classmate or friend and see whether the red team or the blue team comes out on top. Slope-Intercept Basketball Game is similar to One-Step Equations Basketball Game in that it has kids solve problems for a chance to catch the ball and shoot a free throw. However, instead of solving one-step equations, kids must solve the problem to find the slope, x-intercept, or y-intercept. Problems are multiple choice and there’s no time limit to answer, so kids can work at their own speed. Nothing But Net puts kids’ shooting ability to the test. 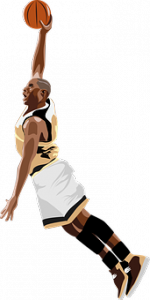 In this game, kids must use their knowledge of force and angles to get the ball into each of the baskets. To make the game more of a challenge, some of the baskets move during the game. Can kids make all of the baskets before the clock runs out? Batter’s Up Baseball – Addition gives children the chance to round the bases by solving addition problems. Solve an easy problem correctly, get a single. Solve a hard problem correctly, get a home run. This game is perfect for kids in first through fourth grade. Those in third through sixth grade may also like Batter’s up Baseball – Multiplication. Both are featured math games on Math Chimp. Grand Slam Math puts kids’ multiplication and division skills to the test through a series of word problems. Kids read each word problem and type the answer into the box. If the answer is correct, they’ll get to see the player round the bases. However, kids don’t have to worry about striking out if they get an incorrect answer. The game encourages them to keep trying and offers helpful hints to help them get the correct answer. One-Step Equations Soccer Game gives kids in upper elementary and middle school a fun way to learn how to solve simple equations. Kids are shown an equation, such as m + 1.2 = 4, and must solve for the variable. If they answer the question correctly, they get the chance to kick the soccer ball and try to score a goal for their team. The ball moves quickly across the screen, so kids have to be ready to go when it appears! Free Kick is a great game to help kids in middle and high school understand concepts such as angles, elevation, curvature, and force. In this game, kids must kick the ball into the net. Before they do, they can control the different components of the shot. Kick the ball too high or at the wrong angle and it’ll miss the goal. Football Math – Adding Fractions Game is designed to help kids in middle school practice adding fractions. The goal of the game is to pass the ball to the receiver. This game is as much about math as it is about passing skills. In order to see a problem, kids must first make a complete pass. If they answer the problem correctly, they earn 7 points. If they answer it incorrectly, they lose 3 points. Mini Golf lets kids play an exciting game of mini golf without leaving the computer. In this game, which is ideal for kids in upper elementary and middle school, kids will learn about force and angles. If they hit the ball too hard, the ball will miss the hole completely. However, if they angle it correctly and hit it with just the right amount of force, they may score a hole in one. Math Pup Golf combines a Yahtzee-style game with a golf theme. In this game, kids roll the dice and use the numbers rolled to check off one of a series of boxes. For example, they may determine that the sum is divisible by two or the product is a multiple of three. The game tests addition, subtraction, multiplication, and division skills, making it ideal for upper elementary and middle school. Kids can play solo or as a two-player game. Andy’s Mini Golf features a fun mini golf course that can be played on the computer or on mobile devices. The game features multiple levels and each level has a different goal. To start, kids must simply get the ball to the hole using the fewest strokes possible. At first, the holes are easy to reach, but become more challenging as the game goes on. Duck Golf gives kids a fun way to practice their knowledge of place value. For example, they may be asked to identify which number represents “eight hundred ninety-nine.” If kids answer a question correctly, Professor Duck Von Fly gets to take a swing. This game is ideal for kids in first through third grade. Pool Practice helps kids learn about angles, distance, and force as they play a game of pool. The goal of the game is to pocket all of the red balls in as few moves as possible. While the concepts of angles, distance, and force are ideal for middle school, kids in elementary school may also enjoy playing the game. Candy Pool is a fun game kids can play on the computer or mobile device. This game takes the classic game of pool and adds a twist. Rather than shooting balls on a pool table, kids must shoot pieces of candy into one another to remove them from the board. Kids must use their knowledge of force and angles to successfully play the game. War Pretzels gives kids a chance to flex their physical and mental muscles through the sport of arm wrestling. In this game, kids choose a pretzel to compete in the arm wrestling battle. They must then correctly solve addition problems to ensure their pretzel is victorious in the match. Skater Math is a great game for kids who enjoy extreme sports. In this game, kids must answer multiplication problems to avoid obstacles while skateboarding down the path. Answer a problem incorrectly or take too much time to get the correct answer and the writer will fall off his board. This game is ideal for kids in third through fifth grades who have already have basic multiplication skills. For more math games, don’t forget to check out the large selection of free math games organized by grade-level and skill at Math Game Time.